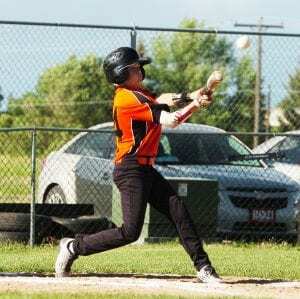 The Mobridge 13-14 Teeners used a walk-off walk to defeat Sully Buttes 12-11 in eight innings at Legion Memorial Field on Tuesday. Sully Buttes used two runs in the top of the seventh to tie the game and force extra innings. They took an 11-10 lead in the top of the eighth on an RBI single by Jordan Schall, his fifth hit of the game. Patience at the plate was the key to the Teeners’ late heroics. Mobridge drew five walks in the last inning. Jack Faehnrich tied the game, scoring on a wild pitch. Five batters later, Jesse Bearsheart drew a walk sending Cole Wellner to the plate with the game-winning run. Taylon Carmody led the Mobridge offense with two hits and three RBIs, including a two-RBI hit during the Teeners’ five-run third inning. Wellner went one-for-three with two RBIs and three runs scored. Faehnrich had a hit, drew three walks and scored three times. Holden Eisemann walked four times and scored three runs. Blaise Thompson, Koby Good Shield and Rocky Good Shield all added RBIs. Schall had five singles and scored four runs to lead Sully Buttes. Jesse Schall and Landon Hepker scored two runs each. Caleb Chicoine ripped a two-run double. Koby Good Shield picked up the win for Mobridge by getting one out. Good Shield came in for Thompson with two outs and two on in the top of the eighth. Thompson pitched four and two-thirds innings of relief after Eisemann started and went three innings. Jesse Schall suffered the loss for Sully Buttes in his fourth inning of relief of starter Chicoine and Marshall Wittler.